You don't need to be a logger to reap the benefits of heavy-duty logger boots. Chippewa has been making them for over 100 years, and their men's footwear are chock full of features any working person will appreciate. Heavy-duty construction, high-quality materials, ... (see full details) (see specifications) #CHP25410. You don't need to be a logger to reap the benefits of heavy-duty logger boots. Chippewa has been making them for over 100 years, and their men's footwear are chock full of features any working person will appreciate. Heavy-duty construction, high-quality materials, and a dedication to comfort make these Chippewa Men's 25410 EH Waterproof Insulated Logger 9 Inch Steel Toe Black Boots your answer to any rugged work challenges. Even better yet - also made in America. Hand-crafted in the USA, these 9-inch insulated shoes feature a secure, lace-up design and oiled black leather uppers for outstanding durability and tough performance you can count on in the field. Heavy-duty and long-wearing Vibram Tacoma Yellow Lug outsoles provide you with reliable oil- and slip-resistant traction on a variety of terrains. The outsoles are attached with Goodyear Welt/Chip-a-Tex construction for long-lasting wear and unmatched strength. Goodyear Welted boots are stitched rather than glued, making them exceptionally durable and completely repairable for years of added wear. Chippewa's signature Chip-a-Tex waterproofing system offers rigorously-tested protection from the elements, so you can work with confidence in any environment when you're wearing this premium footwear. With ASTM-approved steel toes and electrical hazard-resistance, you're guarded from a whole variety of workplace hazards for on-the-job protection you can count on. Inside these shoes, you'll find DriLex lining, which works to wick away moisture and perspiration so you stay dry, cool, and comfortable day in and day out. The collars on this pair of boots are cushioned for a more comfortable and supportive fit. Removable orthotic insoles help soften your steps and absorb shock, so you stay easy on your feet no matter how many hours you put in. Chippewa adds steel shanks to provide solid arch support for less fatigue after long days on your feet. Logger or not, these Chippewa Men's 25410 Black Insulated Waterproof Logger Steel Toe Boots are your answer to rugged and rough working conditions. Pick up your pair of Chippewa boots today for the comfort and durability you need to head to work with sure-footed confidence. I have worked in the field for 35 years doing construction and maintenance jobs. Before these boots, I had tried them all, at any price. 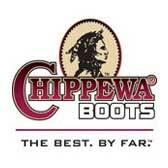 Once these Chippewa boots were put on, I had no need to look further. First, they are really comfortable. Second, they are protective of any abuse they encounter. Thirdly, they last over the years and even have a return for refurbishing mailer program. WOW! Plus they are made in America. The neat little American flag at the toe of the laces is a constant reminder. I bought these boots for my husband when they were initially recommended by a co-worker. He spends 12 hours per day in them and absolutely loves them. Not only great for work, but also for motorcycle riding. Great wear, great looks, and the quality is the best we've come across. He'll never wear another brand! Comfortable from the very first day, no breaking in time needed and that has never happened for him. Love these Chippewa boots so much I'm thinking of getting a pair for myself, great boots for the Harley! Well worth the price! Had these for about a year, replacing a well worn pair of Georgia 9380. They seem to fit a bit on the narrow side but that was not an issue. They broke in quickly and were comfortable. The insulation is nice, but not too much to be unpleasant in the summer. Overall, good all around boot. Waterproofing was ok, but the Georgia's were better. After about a year, there is something starting to pull apart in the liner. Soles are starting to separate from the boot at the toes and ball of the foot. Would I purchase again? Unlikely. 10 out of 13 people found this product review helpful. Chippewa Boots: Men's Steel Toe 25410 Insulated Waterproof Logger Work Boots is being added to your cart.